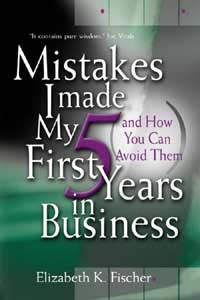 Mistakes I Made My First Five Years in Business (and How You Can Avoid Them), released by Monarch Tree Publishing Inc., is a book written for entrepreneurs by an entrepreneur about the mistakes she made during the all important first five years in business. Based on real life experiences, this book gives a perspective on why these mistakes happen and how to avoid them. Beginning with a rule list that the author, Elizabeth K. Fischer, compiled to help avoid unprofitable, stressful situations, the book addresses several mistakes not typically addressed in business books about the first five years in business. You may buy the book in print 19.95 (includes shipping) and audio 14.95 plus tax.